A parliamentary report of 1777 recorded parish workhouses in operation at Knighton (for up to 12 inmates), Narborough (8), Oadby (30), and Wigston Magna (32). County of Leicester: Aylestone (2), Blaby (2), Braunstone, Cosby (2), Countesthorpe (2), Croft, Enderby (2), Foston, Glenfield, Glenn [Glen] Parva, Huncote, Kilby, Kirby Muxloe, Knighton, Leicester Forest, Lubbesthorpe, Narborough (2), Oadby (2), Potters Marston, Thurlaston, Whetstone (2), Wigston Magna (3). Later Additions: Braunstone Frith (from 1861), East Wigston (from 1894), Freakes Ground (1862-91), Glenfield Frith (from 1861), Kilby Frith (from 1861), Knoll and Bassett House (1861-1909), New Found Pool (1862-91), New Parks (from 1862). The population falling within the Union at the 1831 census had been 13,061 with parishes ranging in size from Potters Marston (population 11) to Wigston Magna (2,174). The average annual poor-rate expenditure for the period 1833-5 had been £9,145 or 14s.0d. per head of the population. A new Blaby Union workhouse was erected at Enderby in 1837. While it was being built, the existing Wigston Magna workhouse was rented for a year. The new building was designed by William Parsons who was a Guardian of the Leicester Poor Law Union. (Because of his position, Leicester had barred Parsons from designing the Leicester workhouse.) His design for Blaby was based on Poor Law Commissioners' model "square" design published by in 1835. In 1836, the Poor Law Commissioners authorised an expenditure of £4,400 on construction of the building which was to accommodate 350 inmates. The site layout and location are shown on the 1903 map below. 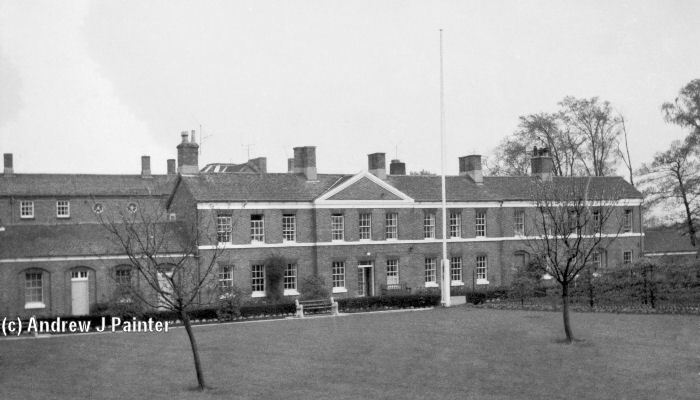 After 1930, the workhouse became Enderby House County Home providing accommodation mainly for the elderly and chronic sick. The picture below was kindly provided by Andrew Painter whose mother was matron at the institution between about 1938 and 1968. Blaby workhouse from the north-west, 1960s. The old buildings were demolished in the late 1960s and replaced by modern premises for accommodating the elderly. The Record Office for Leicestershire, Leicester and Rutland, Long Street, Wigston Magna, Leicester, LE18 2AH. Holdings include: Guardians' minutes (1836-1930); Births (1867-1926); Deaths (1866-1914); Creed register (1899-1938); Punishment book (1914-27); Bathing register (1914-39); etc.